My form is currently unavailable! We have an event registration and emailed this link. Having trouble with the form. Attaching a screen shot. Was the submission limit in the "Preferences" set lower than 100 previously? 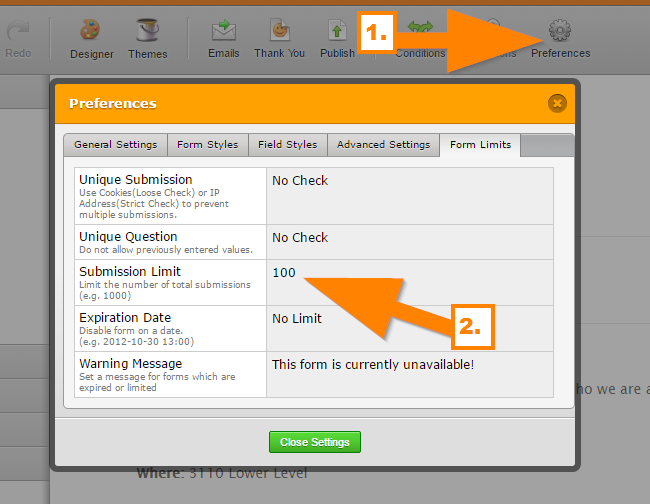 If so, when you reached the submission limit, the form automatically becomes disabled. I seem to be having the same issue, but it's limited to just a few pages. The rest seem to be going ok?? To better assist you, I have opened a separate thread for your concern. Please refer to this link instead: https://www.jotform.com/answers/838752. We will address it shortly. Thank you.